Not only do the artists of Miriam’s Studio express their vision through paints and clay, but they also have a lot to say in verse. The paintings in this exhibit are equally thought provoking. Satire makes its appearance in Donnie Mayer’s painting “Hoofball National League: Where the Pigs play the Hogs with Donald Trump’s Head as the Ball” and “A Passion for War: A Satire About our Love to Destroy the World.” Wil Lake’s painting, “Don’t Bomb Iran” echoes this theme. Vibrant colors characterize most of the work. Rural and urban landscapes roil with energetic brush strokes. Floral motifs crowd the edge of the canvas. 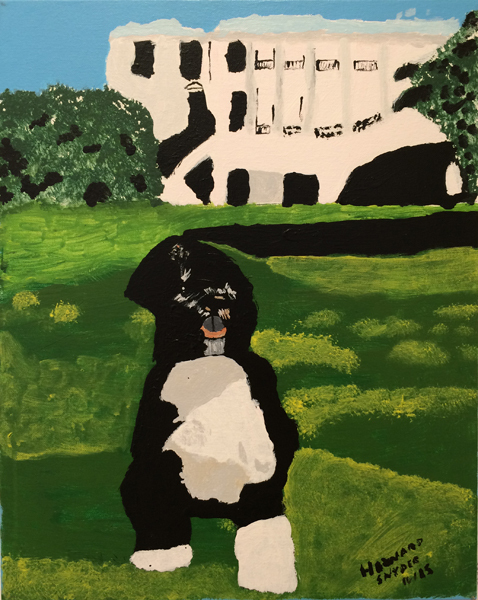 Human figures interact with each other and presidential dog Bo steps toward the viewer. Brushwork may be textural and active, or carefully applied and nuanced, depending on the artist’s frame of mind. Miriam’s Studio. Their award-winning art therapy program promotes feelings of dignity through art expression, provides marginalized individuals with a sense of belonging, and is an effective vehicle for guiding people towards positive change.Miriam’s Studio offers a safer space, materials and guidance for participants who draw, sculpt, collage, paint, and make jewelry. Some projects are completed in a single session, while others take several sessions. During the creative process, the art therapist, art therapy intern, or skilled volunteer observes and engages participants as they speak openly and gain support from each other in a safe and trusting environment. Opening Reception: Friday, November 6, 2015, 6-8:30 pm at Touchstone Gallery, 901 New York Ave NW, Washington. Miriam’s Studio groups are offered Monday through Friday, 8:15-9:45 AM and 2:30-4:00 PM. Included each week during Studio hours: Open Art Studio, Art Therapy Groups, Creative Writing activities and groups, and Yoga classes. Additional activities include theater, art exhibits and other field trips.